After my last post about airplanes, a lot of you are wondering how we got along on our trip with regard to restaurant dining. Yes, the airplane does seem tame in comparison to dining away from home on an extended trip--that's when the "fun" really starts. I have several things that I do to screen a restaurant, particularly if we have never been there before. I have a 3-pronged approach to restaurants and communication is the key. 1. Look up the menu online or in person. Some menus now say that they "welcome allergic diners" but even if they do, carefully review the menu items. Does the menu have a lot of risky foods? Do they state that they use peanut oil or other nut oils frequently? Is it a huge menu with lots of dishes (and thus, lots or chance for cross-contact or mix ups)? If this is the case, I move on to the next place. There is too much cross-contact risk for me to feel comfortable. 2. Call the restaurant. Ask to speak to the manager and ask specific questions and evaluate the answers. We always ask what oils are used, for example, and how they handle an allergic diner's order. Is it separated from potential allergens with clean pans, utensils, etc? Is the manager comfortable with your questions or does he/she seem worried or unsettled? You're trying to find out their comfort level with food allergies and diners. Also keep in mind that language barriers and certain cultures may not be as understanding of your needs. That's why we avoid cuisines such as Asian or Indian restaurants where there is just too much risk of nut allergen contamination. You must be clear and you must be ready to walk away. A meal isn't worth the risk. Find somewhere else. 3. Reinforce your needs once inside the restaurant. Locate the manager or chef and speak to them about your order; sometimes the server has no idea what ingredients are in a particular food, so don't rely on them alone. Also, order a simple meal without sauces for your allergic diner. Grilled foods are a great choice. Avoid meals with tons of components--sometimes it's hard to figure out what is in those. If you want it spelled out for the chef, you can download a free chef card template from FAAN. If, once inside the restaurant, something seems off or they change their tune, please go elsewhere. It's never worth it--and will you really enjoy the meal if you're worried about allergic reactions? This sounds like a lot of work but generally it is a pleasant experience. We've had very good experiences with chefs in general. Any chef worth his or her salt will want you to enjoy your meal and will want to provide you with a safe dining experience. If you get a bad vibe, leave. 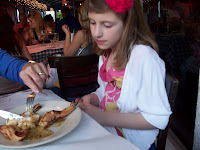 Here is a link to another post I wrote about travel and dining out. I also like this link for dining out tips from FAAN. Another wonderful resource on dining out with food allergies is found in Sloane Miller's recently released food allergy book: Allergic Girl: Living Well with Food Allergies. I don't often comment on blogs, but I wanted to thank you for yours. As the mother of a food allergic child, I appreciate the advice and am grateful that you are trying to help others who are on this journey! This was very helpful! We have three boys and my youngest who is almost 2 has a peanut allergy. We are planning our vacation and we have been stressing about where and what we will eat. You've given me some ideas as how to approach a restaurant. Thanks!! Thanks! This stuff is really helpful to people. Dining out is hard enough - it's harder when traveling because you can't bring as much from home. We live in NYC and like Sloane, we eat out a lot with our 6 y.o. There are a lot of restrictions but we make it work. What's helped is not just to learn the chefs that are amenable, but the CHAINS that are. For example, in Manhattan there's several nice restaurants all owned by the same owner and they happen to train their employees well on FA, cross-contamination etc. Any restaurant you're in of theirs they have a code on the check for FA and are all over it! Things like that help. You can have a great experience, it just takes planning AND the willingness to leave if you're not comfortable at all. Thanks for posting. This and the flying piece were very useful.